Do you love to travel but it’s just not in the budget? 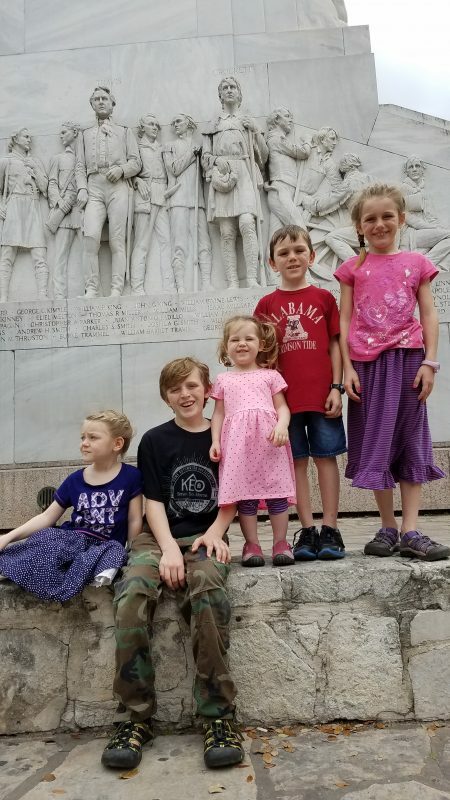 In the last year our family of 7 has traveled all over the country, learning and making amazing memories–on a budget. In fact, we paid of 28k in debt WHILE visiting over 15 states! I know no one wants to cook on vacation (heck I don’t wanna cook when I’m at home sometimes, that’s why I double a lot of meals so I can #cookonceeattwice!) but food is often the biggest expense on the road and the place where you can save a ton of money if you’re willing to plan ahead! Toaster ovens, instapots, hot-plates–they all fall in this category. 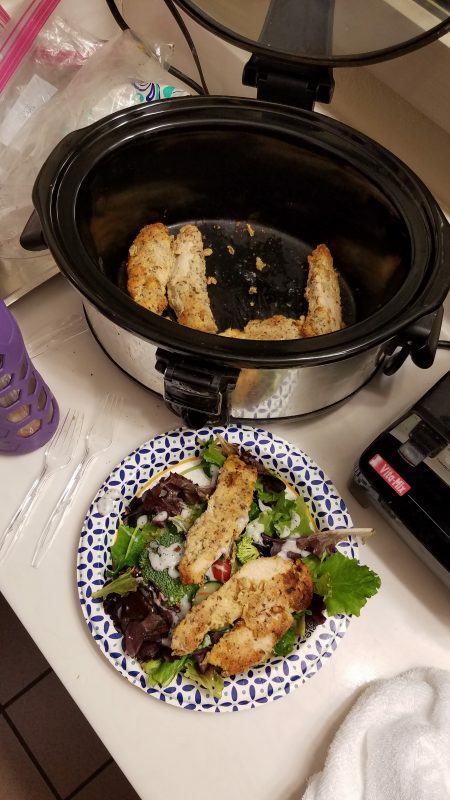 But I’ve found a crockpot to be the most flexible–I can reheat everything from soup to omelets to muffins to casseroles all in one appliance. Whatever you use, make sure you test your recipes and reheating methods at home before your trip so you know what works and meals on your trip can be simple and low-stress. 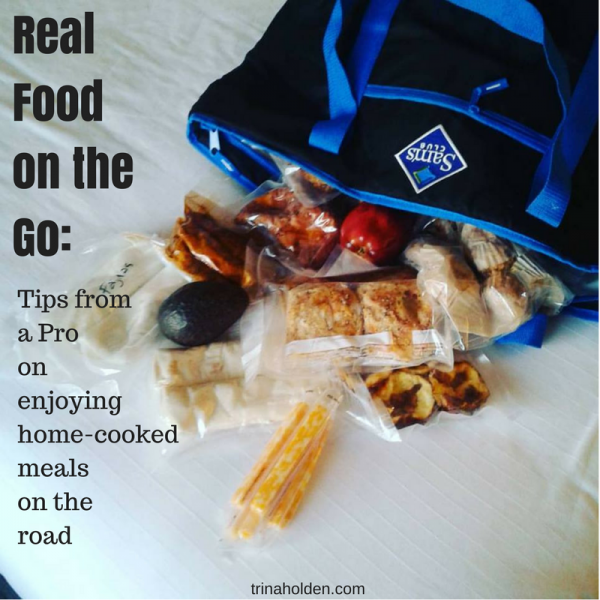 For more info on cooking ahead and how to pack food for flying or driving–check out my post on 3 tips for taking home cooked meals on the road. 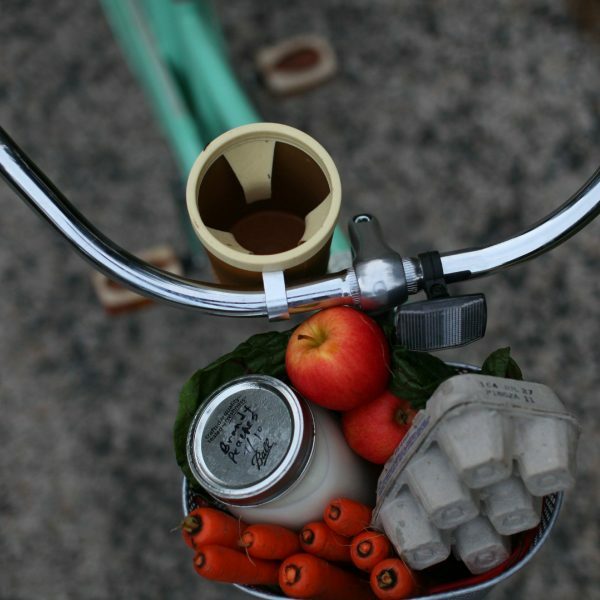 Whether you make meals ahead or decide to simply do sandwiches, you will probably need some groceries on your trip. Instead of driving around trying to find a grocery store, or hiring an Uber if you don’t have your own wheels, try shopping online! We just learned this trick and at first it was a little weird…strange to choose food in an online format, and wondering what shape it would be when it got delivered? Our first experience was super positive and we have been using it since to save time and effort and make our trips feel more like vacation even while we are saving money. Amazon Prime Now is available in most major cities and lets you choose groceries sourced from local vendors they are packaged up in insulated bags and delivered to your hotel in a 2 hour time frame you choose, and if your order is over $50, delivery is free. It’s as easy as ordering pizza, but a whole lot healthier! When we fly, we bring the things that we make ourselves and can freeze and check in a cooler, and we order in things like lettuce, milk, and other perishables when we arrive. 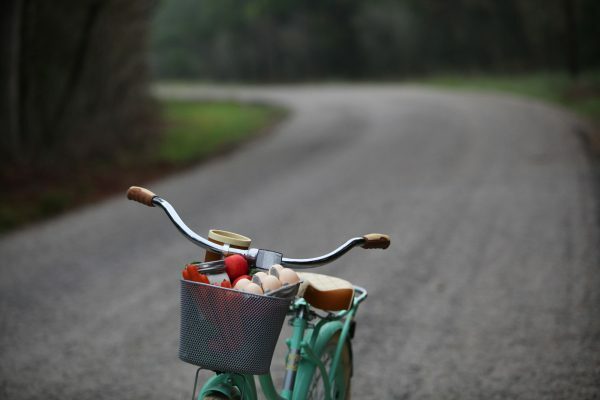 When we drive, we do the same thing–order in the grocery items we don’t want to trek across the country, or anything we ran out of on the way: fresh fruit, eggs, bread, etc. I for one don’t want to spend my vacation time navigating to and through an unfamiliar grocery store–that’s a chore when I’m home, how much more when I’m out of state? Ordering online and having the food delivered to my door saves time and the money I’d otherwise spend at a restaurant. Candle in the Window is a Christian Hospitality Network that helps traveling families with a budget friendly, fellowship-rich way to eat and sleep on the road. The network connects families who are hospitality-minded who are willing to offer a home cooked meal, sleeping space, or both to other families coming through their area. Members find each other with an online directory that is world wide and offers a safe, private way to make contact and make travel plans. They have some great guidelines and parameters in place so that connections are smooth and members are not overwhelmed with requests or the effort to host. It’s basically like Christian Couch Surfing, or a FREE version of Air B and B. It’s not for everyone, but our family has been blessed by it! We have been members for 6 years, and typically get member requests 1-3 times a year. We have hosted families from as far away as Belgium, and have enjoyed getting to know our guests and been blessed to be a part of their journeys. We have also used the network for overnight stays on trips to and from destinations. Every time we have used this unique opportunity, it has been a blessing and we have made life long friends in the process! 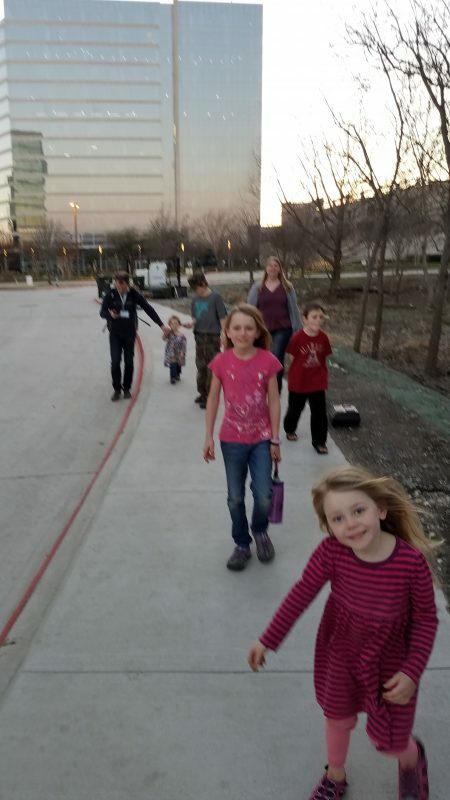 We looked at the directory and found there were multiple member families in the area of Texas where we would be ‘camped out’ between events, so we contacted several and soon had our itinerary set. We stayed at a hotel during the wedding weekend and the conference, but our trip out (which we did over two days) and the 5 days between events we stayed with 4 different families in the network. Accommodations ranged from a living room over the garage with foutons, to a camper in the hosts’ driveway. One night we had a guest house all to ourselves, including laundry facilities to get caught up on 7 people’s laundry, at another stop our hosts rearranged their kids and gave us two whole bedrooms to ourselves. Everyone was so accommodating, emailing to ask about food preferences or allergies, making our kids feel at home, blessing us with home-cooked meals and tips for local attractions that would appeal to our kids’ ages and interests. The best part was that at each stop we were guaranteed rich fellowship with prayer and family worship a part of each home we were in. Our kids got to meet new people, see how other families function, and practice the skills of being gracious guests. Visit Candle in the Window to become a member! So, that’s how we saved $100’s on our last road trip. If that last idea intrigues you, you might enjoy reading the story of a woman who stayed with over 30 host families in the network as the God led her on an epic trip around the country with her 4 children. That book is called “Journey to Somewhere” and is available on Amazon. It’s an amazing story (and you might get to read about what the author’s experience when she stayed in our bus here in Alabama!). It all started when we wanted to pay off our debt. But we also wanted to travel. But, it worked. We were gone 5 days and only ate out 3 of our meals. Score! Now we bring most of our food whenever we travel anywhere–including by plane, and even with 5 kids! Here’s a video explaining just how I go about choosing which meals to bring and how to pull of this feat without stress. 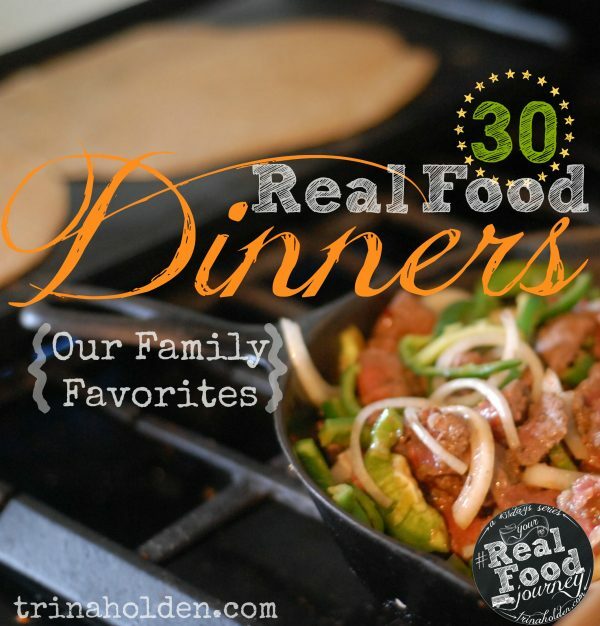 Choose meals you know your family will love. 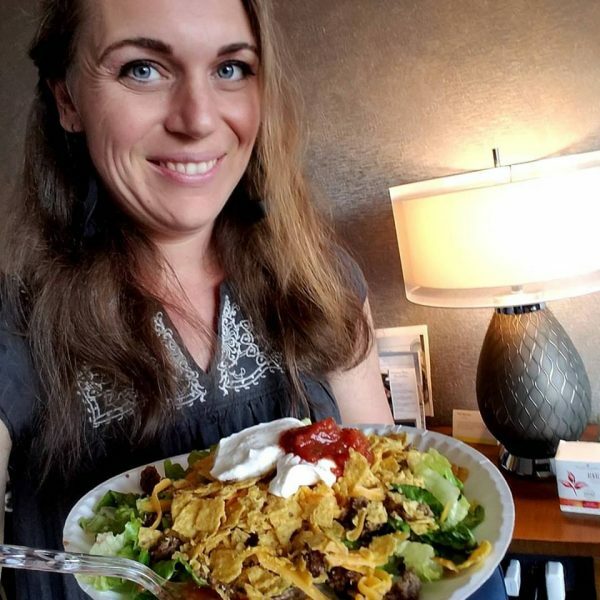 This is not the time to make massive strides toward micro managing your carbs or going sugar free….the whole point of taking your food with you on the road is to save money and eat healthier. Almost anything you make in your kitchen is going to be healthier by far than fast food, so relax and choose meals that will be gobbled up so you have no waste. This doesn’t have to mean a complete compromise–I’m just asking that you not stress out about your choices, because you’ve already made the healthiest choice in choosing to cook from scratch! Family favorite Cheeseburger Soup filling our bellies between sessions at a business conference. Begin prepping 3 weeks out. I’m not kidding–this is the true secret to doing this without losing your mind, from one who’s been there. Decide what you’re having 3 weeks in advance of your trip, then plan each of those meals into your menu in the following week. Then, each time you make it, double it and freeze half. If at least one meal a day is a ‘double and freeze’ meal, you will painlessly stock your freezer without feeling like you did any extra cooking! 4 days worth of meals for one person: What I brought when I flew to Utah this summer! Once I found the recipes that worked, I basically use the same menu each time. Freezing and Traveling: I usually pack everything in vacuum seal bags to avoid mess. 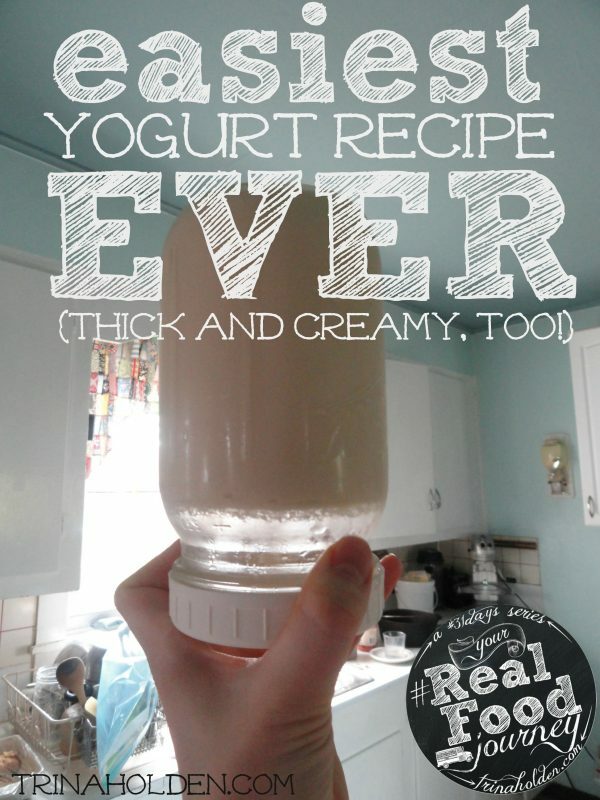 (You can also use ziplock, but be sure to double bag liquids!) The morning we leave I throw all the frozen stuff in the bottom of a cooler, and the fridge condiments and foods on the top, and it’s usually safely cold for up to 10 hours. When we fly, I put the frozen items in a collapsible freezer bag (like the ones you get at Costco or Sam’s) and pack it into a suitcase as checked luggage. We buy things like lettuce and yogurt once we get to our destination. Reheating and Serving: Small, hand held foods like egg muffins or baked oatmeal muffins can be heated on low in a crockpot in about the time it takes to wake and dress a family of 7, or shower and curl my hair. Soups can heat within an hour on high, or be ignored while you’re out having adventures for 4-5 hours on low. 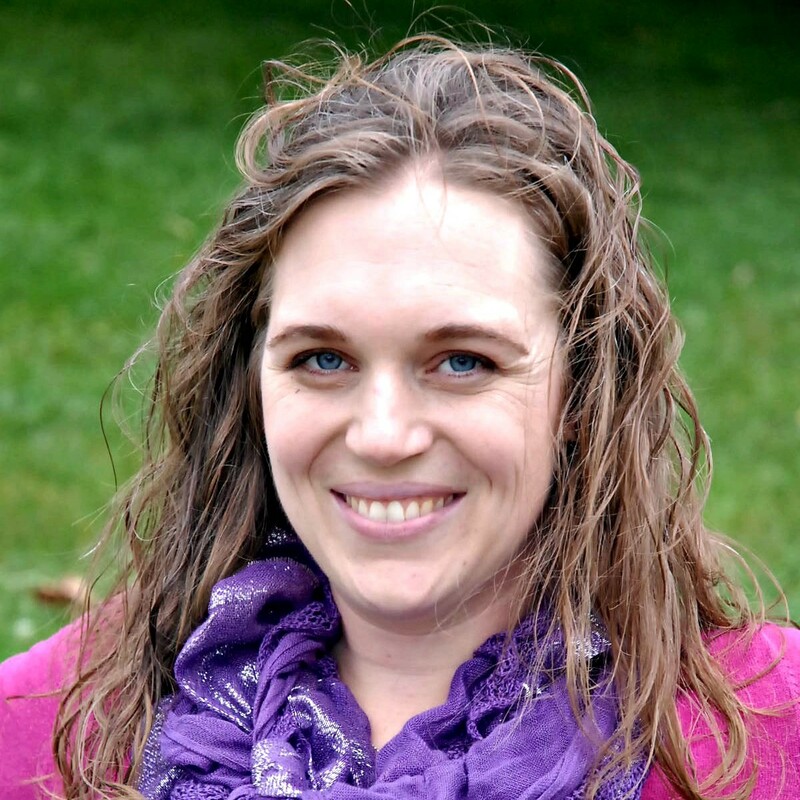 Crockpot–I use a 4 quart when I’m only eating and serving one meal at a time for our family. This is the exact crockpot I use when we go on road trips. Hot Plate–When flying, this is a slimmer, lighter option for a heat source. Don’t forget a skillet to heat things up in! Vacuum Sealer–I absolutely love the one a friend gave me last year–totally makes the whole process tidier! This one is similar to mine. 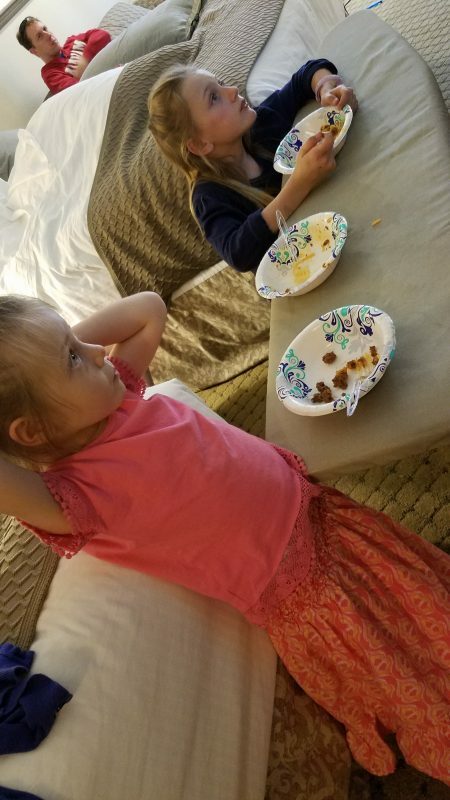 We have traveled as far as L.A. this year, and been on the road for as long as 2 weeks at a time with 5 kids and have saved $100’s (and eaten healthier!) by taking our food with us. In the last year we have traveled to 15 states and still managed to pay off $28,000 of debt while doing what we love to do…travel! Travel doesn’t have to cost you an arm and a leg. Save big by bringing your own food. 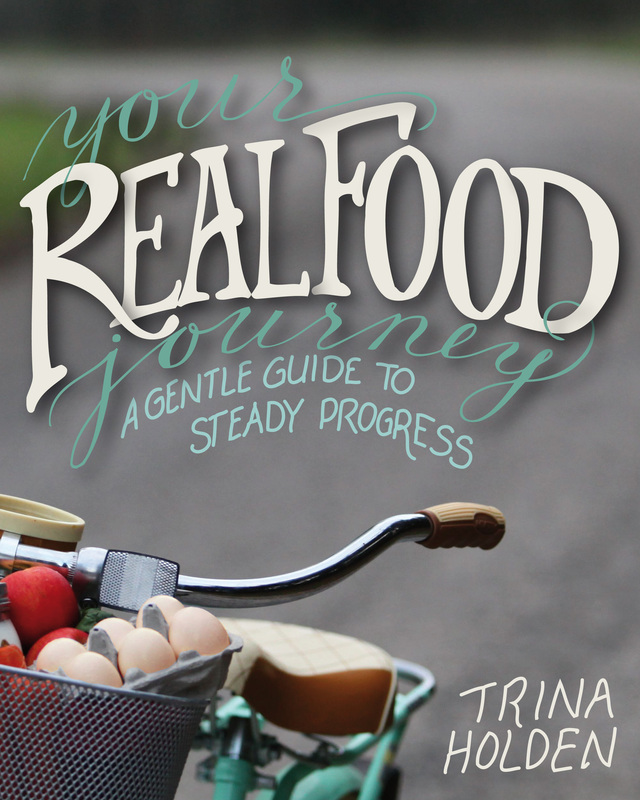 If you’re ready to eat the best you ever had on your next trip…while spending next to nothing, grab your copy of one of my cookbooks today and begin prepping! Who wants a summer vacation from cooking? Yehaw! That sounds amazing! Sign me up! No, seriously! There has got to be a way to simplify the kitchen this summer so that we can all have a little bit of a break, right? I know what stress does…. First, a little background. 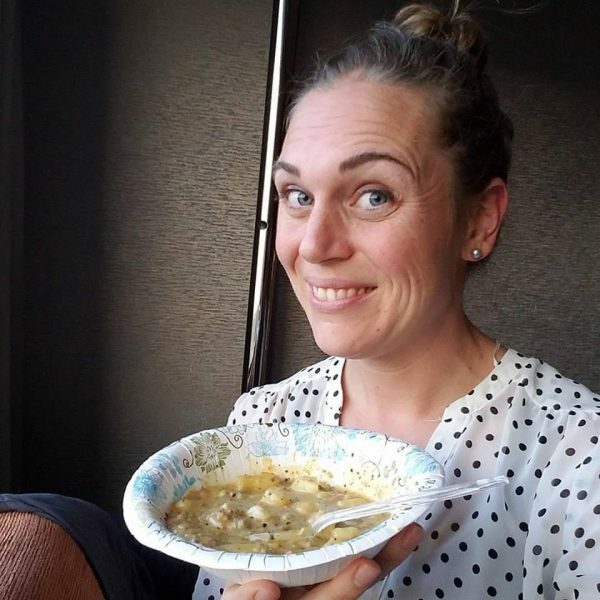 If you’ve been here for very long, you know that my passion for cooking healthy foods for my family and this blog came from a season of scary health issues in my life. I was 23 years old when I was told I had the liver of an alcoholic. My skin, my cycles, and my digestion were all wonky, and my doctor was very concerned. She saw that my body was super stressed, and was not sure what the cause was. She started me with diet changes first, hoping that we could avoid more drastic measures and–what do you know?! Changing what I ate changed my life. It was little things, over time, that got you where you are with your health. And it can be little things, over time, that can get you back to where you want to be. The first change I made was to up my probiotics and digestive enzymes. First I did that with pills, then I gradually learned to do it with foods I made myself like kombucha, sauerkraut, and kefir. Second, I reduced foods that my body found difficult to digest at the time (for me it was sugar and wheat flour). These two small changes did not overwhelm me, nor add more stress to my life (which was a good thing because I was planning a wedding and getting married in 3 months!) and the best part? I was able to sustain them through the busy year ahead, becoming a wife and a mom–and actually, it’s been 12 years that I have continued to do those two things! And that’s where we come to my nugget that’s gonna de-stress you summer and help you continue to make progress on your health even when life gets busy. If you’re reading this kind of blog, chances are you have a list as long as your arm of things you want to buy, make, ferment, bake, stew, or slurp for the betterment of your gut and your over all health. And I applaud you for choosing to take your wellness in your own hands and doing the work to improve your health. But what I don’t want you to do is tell yourself you’re gonna tackle that whole list on Summer break. I’m gonna challenge you to choose ONE thing. One thing that you KNOW would impact your health, and then do that ONE thing until it’s as brainless and routine as brushing your teeth. Then and only then, should you move to the next thing. Maybe that ONE thing is just remembering to take that supplement you know you need to be taking every day. Maybe that ONE thing is making and using bone broth in your diet daily. Maybe that ONE thing is learning to make kombucha and ditching sodas. Whatever it is, choose that thing, write it big on a sheet of paper, and put it on your fridge. Then, when you’re tempted to get overwhelmed about all. the. things.–remind yourself that you are mastering that ONE thing, and you’re not allowed to stress or obsess about anything else till you get this down. Here’s the truth–small changes over time are more sustainable and likely to stick than HUGE changes that burn you out in 3 days (I’m looking at you, drastic-diet-of-limited-foods-you-can-barely-stick-to-for-a-month!). Do it for yourself. Do it for your kids. Do it for the summer. Choose one thing to master, and don’t move on till you get that one down. P.S. 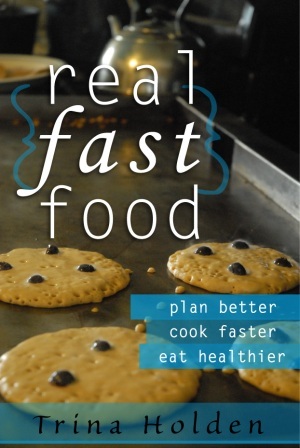 if your one thing cooking more dinners from scratch this summer, check out my book, Real Fast Food for our family’s simplest, healthiest favorites! When you don’t have time for homemade bread, but are desperate for something to smear butter on and stuff in your mouth (#buttervehicles! ), why not try making your own homemade bagels? How to Make Bagels: Faster and Easier Than You Thought! 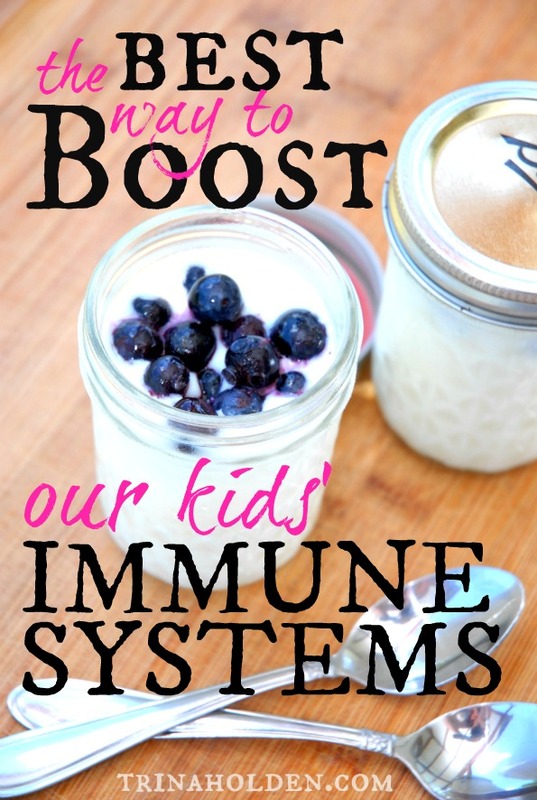 Simple ingredients and a fun process make this great option for weekdays and cooking with your kids! Mix all dry ingredients in the bowl of a mixer with a dough hook attachment. Pour in the hot water and mix on medium till all flour is incorporated. Gradually add ½ to 1 cup more flour until the dough forms a clean ball around the dough hook and/or cleans the sides of the bowl. *You want a good, stiff dough--it should not be sticky when you poke it with a finger! Knead for 5 minutes then cover to let rise for an hour. When dough has doubled in size, put a wide saucepot on to boil with 3 tablespoons sugar in the water. Shape the dough: Divide dough into 12 pieces and roll each piece into a log or 'snake' roughly the width of both your hands. Then, overlap the ends to form an "o", and roll to seal the ends to each other. (See video #1) Dust the bottom of the bagel and set bagels on dry baking sheet to rise slightly for about 20 minutes. Preheat your oven to 400 degrees, then gently transfer 3-4 bagels to the boiling water. (see video #3) Cook on one side for about a minute, flip with a slotted spoon, cook one more minute, then put them back on a greased baking sheet, preferably lined with parchment paper. When all bagels have been boiled, whip up an egg white till frothy and paint bagels with the egg wash.
Bake at 375 for 30 minutes, or until golden brown. Lovely fresh, even better toasted! Here’s some videos I took of our whole process so you can see just how I do this…with 3 and almost-2 year old helpers! When shaping is done, send your helpers off to play again, this next step involves boiling water. Yes, bagels are boiled before they’re baked. Part 3: Boiling the Bagels for that Classic Bagel Texture and Chewiness! Do you have a sourdough version of this recipe? 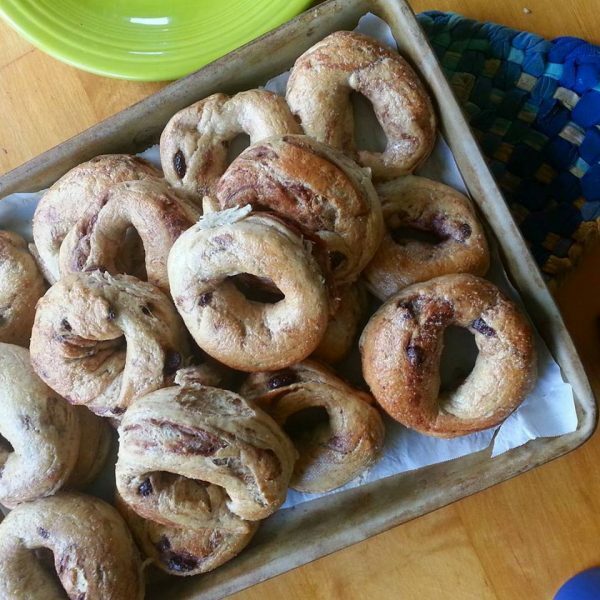 Not perfected for publication yet, so I’m gonna send you over to my good friend, Kelsey, who rocks sourdough and has a great recipe for sourdough bagels on her blog! Can I put different toppings on my bagels? Yes! Just skip the kneading in of the raisins and cinnamon, and instead, sprinkle on poppy seeds, onion flakes, sesame seeds, or even cinnamon and sugar AFTER the egg wash and BEFORE you bake them. Can I store homemade bagels in the freezer? How and how long? If you want to make a double batch and save some for another day, I recommend slicing them before freezing, that way you can literally grab one straight out of the freezer and pop it into the toaster when you need a #buttervehicle STAT! If you freeze them, they last several weeks, or months if you’re not super picky or own a vacuum sealer! Silcone Dough Scraper. Don’t waste dough or have a messy bowl to clean. Stoneware Pan. So easy to clean, and nothing sticks. Love it. Food Sealer. Great if you like to freezer cook and keep baked goods fresh while frozen. Links are affiliate links–thanks for helping us keep the lights on! Do you love bagels? 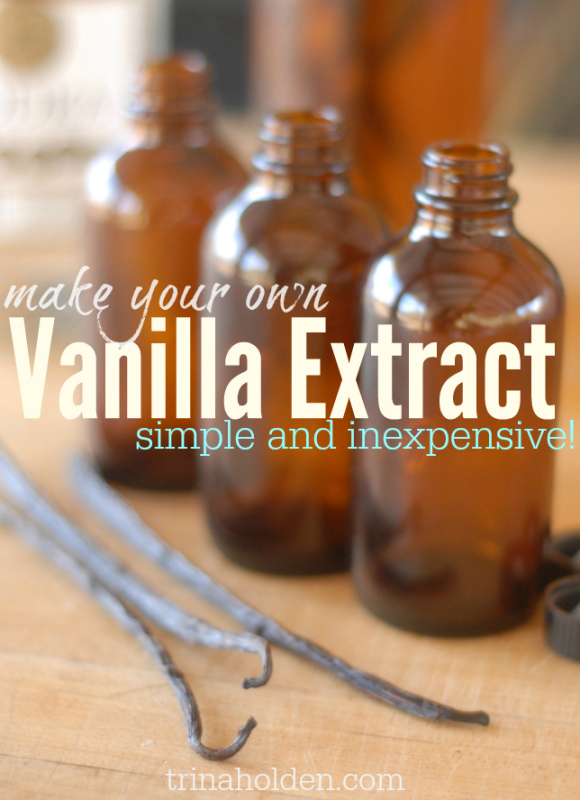 Have you ever made them from scratch? Tell me what’s keeping you from trying….